Trimble Nomad - Wi-Fi (80211b/g), 1D Laser Scanner, Windows Mobile 61, 128MB RAM/512MB Flash, Numeric Keypad, Bluetooth, GPS, Camera, 5200 mAh Battery, Compact Flash, SD Ports, Color: Yellow. Interface Cables And Charging Cradle Sold Separately. 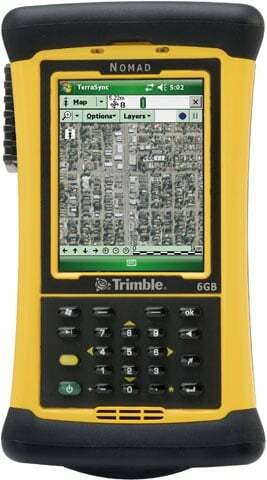 The Trimble Nomad outdoor rugged handheld computer has power and capabilities to help you do more in the field. The Nomad computer is extremely rugged, meeting rigorous MIL-STD-810F and IP67 standards for water and dust, yet is light and easy to carry. Featuring an 806 MHz processor, the Nomad computer also includes 128 MB of memory, a long-life 5200 mAh lithium-ion (Lithium-ion) battery, a sunlight readable full VGA display, integrated Bluetooth, user-accessible CompactFlash (CF) and SD/SDHC card ports, plus I/O ports that include USB host/client and an audio jack. Carrying Case, X Deluxe, Compatible with Trimble Nomad. Battery, Lithium Ion, 5200 mAh, 3.8V DC, Compatible with Trimble Nomad. The Trimble NMDAJY-111-00 is also known as NMDAJY-111-00	or NMDAJY11100	.